In our VIN Decoding 101 series of articles we have focused on which vehicles are required to have 17-digit VIN numbers assigned and what data is and is not captured within the VIN. We have seen that country of sale, vehicle segment and type, model year and manufacturer all play a big role in the usefulness of VIN decoding and the type and depth of vehicle details the VIN will encode. For many applications a basic VIN decode, one that decodes only what is encoded in the VIN, will provide all the details that your business needs. However, there are also many common VIN decoder applications where there is need and substantial benefits for more detail, as much as possible. How can this need be met? The most common additional data point accepted, as well as one of the most useful, is the OEM assigned model number. This is also commonly referred to as the order code. With the model number you can usually determine vehicle trim, transmission, standard features and sometimes special packages tied to the vehicle. Adding this detail will also substantially increase the rate of exact match returns from the decoding service you are using. This is a second vehicle code assigned by the manufacturer, mainly used by the Detroit Three (Chrysler, Ford, GM), that is used in conjunction with the model number to identify the style and trim of the vehicle. This datapoint is especially helpful in decoding light-duty trucks and truck-based SUV down to a single vehicle style. Some manufacturer specific terms for what is classified as an OEM package code include "equipment group", "series code", "body code" and "quick order package code". OEM's assign codes to all optional aspects of the vehicle. These include individual options, marketing packages, engines, transmissions, emissions and color codes. These codes can be used to identify all optional equipment on the vehicle. In addition, some VIN Decoder service providers can use even a couple of these codes, if available, to determine trim and other optional equipment tied to the vehicle through option associations and availability. Sounds great right? This is an ideal vehicle identification solution if you can gain access to the data listed above. What is the catch you ask? The barrier for most businesses is availability and access to this level of vehicle data. These model numbers and codes can be a real challenge to acquire. If your business process includes physical examination or access to the vehicles you are decoding, it is possible to obtain the model number and OEM codes from the vehicle itself. These OEM data codes are usually recorded on a badge or sticker mounted somewhere on the vehicle. The location varies by manufacturer and model year, however, common locations include the door jam, glove box and under the hood. If you can use this data to differentiate your product or service, and you have to interact physically with the vehicle as part of your normal business process, it could be worthwhile to manually gather this additional information. 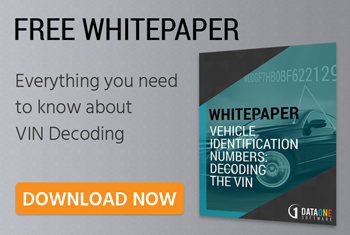 Most businesses utilizing VIN decoding do not have the time, inclination or access needed to search each vehicle for a list of model and equipment codes. For this super majority, these codes are only available from a franchised dealer's DMS for "New", and often "Certified Pre-Owned", inventory for sale, or directly from the OEM. Unfortunately, gaining access to the dealers DMS is becoming more and more challenging and expensive. Even the inventory feeds dealers provide to classified listing sites and portals rarely, if ever, include these valuable codes. While OEM specific numbers and codes can be a challenge to acquire, there are often additional details in the vehicle data feeds available to many businesses. These details are not standardized and are usually descriptive in nature. "Automatic", "A/C", "Leather", "Heated Seats" and generic interior/exterior color descriptions are examples of descriptive details that are commonly available in inventory feeds for new and used vehicles. The most powerful vehicle decoding solutions available today, including our VIN Decoder API, are able to accept these additional, non-standardized inputs and use them along with the VIN to provide a more precise decoding return, often to an exact style match. If your business has access to this sort of descriptive data, and could benefit from more precise and detailed vehicle decoding, this should be a required feature from your decoding service provider. Make sure to ask before you buy, because few providers can support these non-standard inputs into the decoding process. Even if you find yourself in the position of needing more data but only having the Vehicle Identification Number to work with, there is good reason not to settle for a simple VIN Decoder. In many cases a VIN pattern may be tied to multiple vehicle styles and trims. However, there are VIN decoding solutions available that can return the vehicle data common to all styles tied to the VIN in these cases. This is often a wealth of details covering everything from specifications to vehicle features and safety equipment. For online inventory listings, this can be an easy way to safely and quickly add valuable vehicle details that make your inventory stand out from your competitors. Using OEM model numbers, package codes, and option codes along with the VIN to decode the vehicle is ideal. The specificity and detail available when using such data to decode your vehicles is going to provide all the information most any business application could desire to use. Generally, though, the OEM code and model number data is something that is a challenge for most businesses to acquire. It is usually available only to those decoding "New" and "Pre-Owned" inventory with access to "poll" the dealer's DMS. When this is not possible, including generic vehicle and option descriptors along with the VIN will substantially increase the information returned with each decoded vehicle. Use of generic descriptors can work equally well for both new and used vehicles when the descriptive data is available. Even when you only have the VIN to work with, there is still good reason to be picky and not settle for just any VIN decoder. The more powerful VIN decoder solutions can provide a large amount of valuable "common" data that is known to be installed on the vehicle even when the VIN is not specific to a trim/style. There are a number of VIN decoder services on the market today. Most basic files and solutions can tell you what is encoded directly in the VIN. However, if your business will benefit from a more precise, detailed and comprehensive data return, don't settle for a service that just decodes the VIN. Determine the inputs that you will be able to provide and choose a VIN decoding solution that will utilize those inputs to provide the most precise and detailed data possible. With excellent data available that can help differentiate your products and solutions, there really is no reason to settle for a VIN decoder that just decodes the VIN. Continue on to the last article of the VIN Decoding 101 series (Part 11): VIN Decoder, VIN Check & Vehicle History Reports: How Do They Differ?